Poignant. Lyrical. Life-affirming. 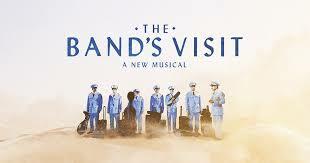 The Band’s Visit is all those things packed into a 90 minute show. This is not a musical with rousing songs and a large ensemble. Rather we’re treated to the story of people coming together through an act of happenstance — people who live quiet lives but dream big. The Band’s Visit tells the tale of the Egyptian Police Band who erroneously head to a town in Israel that has a similar name to a town in Egypt. As the locals sing “Welcome to Nowhere,” we learn about the residents of Bet Hatikva. Among them there’s the lovely proprietor of the lone cafe, the unhappily married couple, the young man standing all night at a payphone waiting for a call from his girlfriend, and another young man who is on an awkward date. The members of the band include the very proper bandleader, a “lady’s man” whose musical idol is Chet Baker, and a clarinetist with an unfinished work. Katrina Lenk, who first came to my attention in her incandescent role in Indecent, here once again proves mesmerizing. Tony Shalhoub brings dignity and humor to his role as the bandleader. You hope that he and Lenk have that “happily ever after moment.” They lead the cast of other accomplished actors and musicians — there are no wrong notes sounded here.